Last year, we did our “Predictions Analysis for 2016” piece right after the US elections. So naturally we had to wait. The new financial year will start soon, so this is the right time to have a look at what is the economic prediction for 2017. It’s very surprising for some people to know how come an IQI holding assesses global macro events with such precision and confidence despite being a small real estate brokerage firm. The reason why IQI holdings makes solid global macro events forecast with such precision is that we get global market intelligence reports based on actual facts /figures from people who are on the ground. Is 2017 set to be a year full of opportunities and of which asset class? The one big trend that will change the way you have to invest this year? Where will the gold / oil market head in 2017? 1. S&P 500 will hit 2,400. I can foresee S&P 500 earning estimates between $124 and $130 a share. If you analyse the earnings of 2016, they are expected to come in around $ 107 to 108 a share. So many people are expecting a pretty big jump in their earnings in 2017. The premise is simple. Higher oil prices will help in the long run. Oil prices have stayed depressed for the last 2 years and now the prices are showing the HEADS. A few mavens are already pricing in a corporate tax cut upto 18–20%. And with Republican control of the government, this will likely happen. At $130 a share, the 2,400 level commands a P/E just trading around 19. I think this is doable. Expectations are already running high. That can certainly carry over to the early stages of policy being enacted. There is lot of enthusiasm after Trump speech for reducing taxes first, which he made it in his inaugural address— stocks will definitely rally. But the question remains: will the overall policy be enough to sustain stock prices all year? This is where market players are having doubts. Earnings estimates for the year ahead are always about 10% too high. Even if we get a boost to earnings from tax cuts, the S&P 500 will likely not hit $130 in per-share earnings in 2017. And if Trump really gets aggressive on the trade front, earnings could be impacted. So, I think we see a rally in the early part of 2017, with market highs coming in April/May. Then we get volatility in the second half and finish 2017 below the 52-week high. Speaking in Dubai on October 25, 2016 to some high valued investors, I have shared with them that oil prices are heading north and would be trading between $75 and $100/barrel by Q-3/2017. Premise is simply based on my observation: Saudi Arabia wants to sell part of its oil company, Aramco, in an IPO. Will it make more with oil at $50? Or at $75? Bankruptcies are happening in North America and demand may touch 95 million barrels per day by the end of 2017. 3. Gold will rally back and trade from $1,500 to $2000 / oz in the second half of 2017. I know gold is getting lot of attention right now since gold is like wealth insurance in these rocky times. Some so called gurus were saying last year because Warren Buffet was bearish on gold, gold would touch $800 per ounce. Warren Buffet is not an angel and has got ZERO position in AU asset class [Gold chemical formula- Au]. Sure, a dead-cat bounce is likely to be sooner rather than later — use it to lighten up. Gold can surprise many people and I love giving surprises. 4. Just one rate hike, in the first half. I believe Yellen wants rates higher in 2017. And she finally has a window of opportunity. Look for first quarter-point hikes in the first half of 2017. But then the economic data starts to weaken, and Yellen has to stand down and go back to the “data-dependent” stance the Fed has had for the last year. 5. Once again, Malaysia GDP can be moving between 4.3 and 4.7%. As I write this piece, Malaysian Ringgit has appreciated 1.5% since Jan 4, 2017 against USD. So yes, I’m padding my prediction statistics with this one. And no, I don’t feel at all guilty about it. Economic confidence, strong aggregate demand and modern infra-structure will drive Malaysian growth this year. The macro fundamentals of the economy are very much intact with positive consumer sentiments back in the market. OK, there you have it. Once again, my predictions are in stone! 6. Russian Rouble is back with vengeance. The Western media said that Russia and Saudi Arabia would collapse since 2015 due to decrease in oil prices. Both countries in fact survived. Russian rouble is gaining strength as oil prices are edging higher in the market. WATCH OUT FOR ROUBLE MAKING THE TURNAROUND. 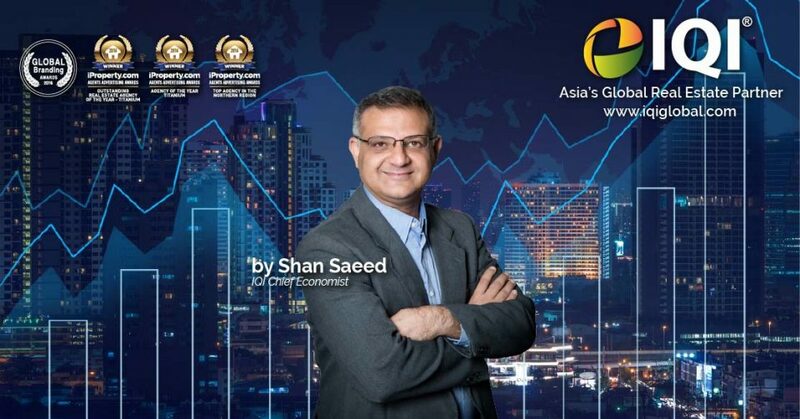 Stay ahead of the curve with Shan Saeed and IQI.